Speed up game prep and streamline play with these three incredibly handy decks! 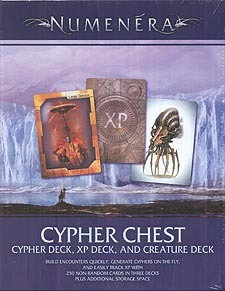 Generate random cyphers on the fly with the 120-card Cypher Deck. Twenty item cards are lavishly illustrated with different device types, while each of the 100 power cards offers multiple power options to match the device. The Creature Deck contains 100 of the most commonly encountered creatures in the Ninth World, pulled from both the Numenera corebook and The Ninth World Bestiary. Just draw a card: You've got basic stats (with a reference to the corebook, for full stats and info) on one side, and an image to share with your players on the reverse. In Numenera, exploration and risk are everything. Award, exchange, spend, and track XP without wearing a hole in your character sheet! The XP Deck is a simple but useful tool that give you a set of tokens to represent experience points. The Numenera Cypher Chest contains all three decks, totalling 250 non-randomised cards that speed and simplify game play both at the table and while the GM is preparing for the game.